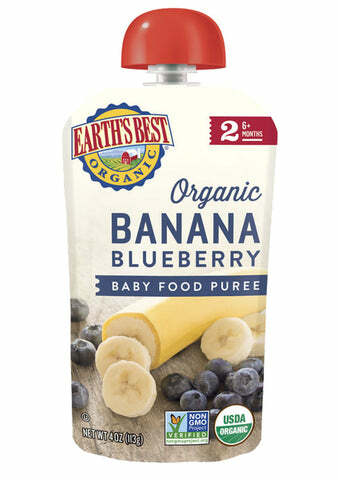 Earth's Best Organic® Banana Blueberry Puree Pouches are great for babies 6 months and older. Containing no genetically engineered ingredients, this wholesome product comes in a convenient pouch for on-the-go families. Earth's Best Organic® Orange Banana Baby Food Puree Pouches are a delightful fruity blend that come in a squeezable, resealable pouch package for convenient nourishment on-the-go. Earth's Best Organic® Peach Mango Baby Food Puree is made with quality organic fruits. This wholesome product is made with fruits not treated with potentially harmful synthetic pesticides to help your little one's normal growth and development. Organic Bananas, Organic Blueberry Puree, Citric Acid. Organic Bananas, Water, Organic Orange Juice Concentrate, Citric Acid. Organic Peach, Organic Mango Puree, Water, Citric Acid. From the beginning of our farming process to the moment when your little one tastes Earth’s Best® products, we ensure a high degree of attention to both ingredient and product quality and safety – from procuring, handling, storing, blending, and packaging through distributing Earth’s Best® products to our consumer.